The 10 Best Steakhouses in Wisconsin! Whether you’re looking for a perfect filet or a juicy sirloin, Wisconsin’s best steakhouses have just the cut for you. America’s Dairyland is home to some of the most widely-praised steakhouses around, with everything from historic supper clubs to upscale establishments. Here are the 10 best steakhouses in Wisconsin! The Five O’Clock Steakhouse is an old-school supper club serving up steaks since 1948. Their cozy setting makes everyone welcome. This spot was also named “Best Steak” by Milwaukee Magazine, OnMilwaukee, Shepherd Express, Milwaukee Journal Sentinel, and Tasting Table. Enjoy live music in their lounge every Friday night. Rare Steakhouse located in Madison offers a unique dining experience. At Rare, you’ll find a mixture of elegance and world class prime steaks served up alongside of their tasty drink menu. Cut right into a sizzling steak and taste the difference at Rare Steakhouse. Not only will their famous name draw you in, but the Brett Favre Steakhouse serves up some of the juiciest steaks in the Green Bay area. The steakhouse is filled with Brett Favre memorabilia and is the perfect place for pre-gaming—the eating kind. Their premium steaks and seafood bring tons of people in throughout the week. Rubb’s offers top quality cuts of steaks, poultry and fish. The steakhouse is located at the new Silver Spruce Resort and offers a supper club charm in the middle of Wisconsin’s most touristy city. No matter what your palate tastes may be, Chef Kokomo has something for you. The award-winning Hunt Club Steakhouse is the place to be in Lake Geneva. Pair your charred steak and side dish with a great wine choice recommended by the knowledgeable staff at the Hunt Club. Settle in and feel at home at the Hunt Club. Steaks just the way you like it. Every great evening starts at the Milwaukee Steakhouse bar and ends in their traditional dining room, filled up and satisfied on USDA angus steaks. Ask for your steak—rare, medium rare, medium, or medium well stopped with their steak enhancement choices. 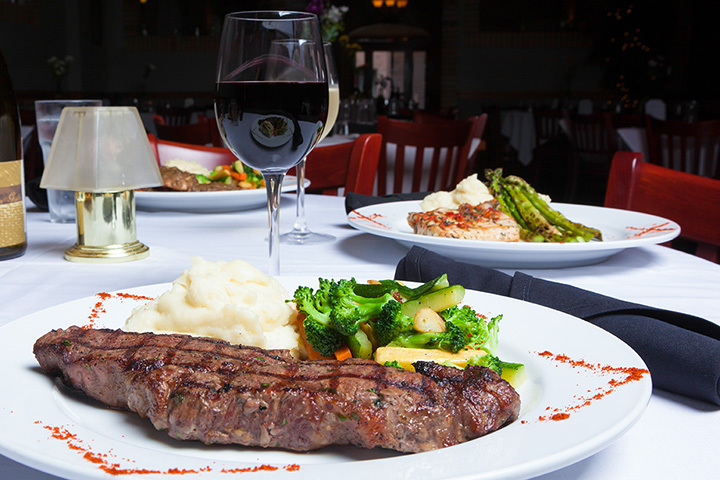 Anthony’s Steakhouse is a classy upscale, American chophouse located in Lake Geneva. Anthony’s has won “Best of Walworth County” for the last five years. Seafood choices and delicious appetizers allow for a lengthy menu and one hard choice! Located in the Northwoods right off highway 70 is McGregor’s Blink Bonnie. Their cozy, up-north supper club makes you feel right at home. Their steaks come straight from the kitchen still sizzling when they’re on your placemat. Check out why McGregor Blink Bonnies steaks are some on the finest in the state. Kurt’s is a casual fine dining restaurant located in the heart of Delafield. Their award-winning steaks land them a spot on our favorite steakhouses list. Try their crowd favorite—The petite tenderloin filet topped with buttered mushrooms and crispy onion rings. Rest easy knowing their steaks are personally selected from the finest chop houses in the area. Try broiled steaks and other tasty daily specials at the Wish Steakhouse located in Weston. You’ll love the rustic atmosphere and comfortable setting at Wish. Product at Wish has been hand selected, perfectly aged, seasoned to perfection. Wish granted!